Happy Valentine's Day! I thought that it would be fitting for today's review to be of a rose themed product. Step forward Tisserand Rose Blend Cream Body Wash.
Tisserand is a brand that has been on my radar for a number of years- it was one of the first brands which I remember from when I was growing up as being dedicated to aromatherapy and I've noticed it in drugstores and gift boutiques alike over the years. 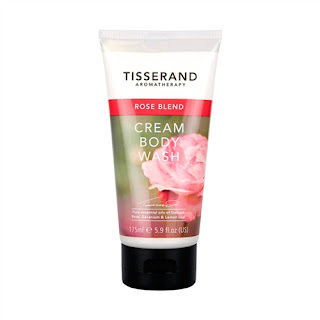 However, it's by no means a brand which I feel familiar with so I was intrigued to try Tisserand Rose Blend Cream Body Wash. I liked the functional tube packaging with its handy flip-top lid, however, whilst it's by no means offensive, I didn't find that it looked luxurious. As I came to the end of the tube, I struggled to manipulate the packaging to get the remnants out. As the name suggests, the texture is that of a pearlescent cream. Despite being free from SLS (it is also free from parabens and synthetic fragrance), there was a gentle lather which could be enhanced with the use of a shower puff. In fact, I found that I went through the tube rather quickly so I'd recommend using this with a shower puff to make it go that little bit further. Tisserand Rose Blend Cream Body Wash contains organic shea butter with vitamins and nutrients to protect skin against dryness and whilst I'd agree that it didn't dry out my skin (which I put down to the omission of SLS), nor did it leave my skin feeling nourished. I certainly couldn't forgo moisturiser after use. Perhaps my expectations were too high as I've previously enjoyed the Elemis Exotic Shower Cream and been so impressed with its skin conditioning benefits. As you'd expect from an aromatherapy brand, Tisserand Rose Blend Cream Body Wash has a pleasant scent which I liked. The scent is based around pure essential oils and classic, feminine rose has interest added with the inclusion of rose geranium and bitter lemon leaf. This citrus element made it uplifting for use in the mornings. The scent didn't linger on my skin once I was out of the shower. Tisserand Rose Blend Cream Body Wash was pleasant enough to use, but it was only an "ok" product which I wouldn't repurchase at £7.60 for 175ml.